Junior Dos Santos finished off Cain Velasquez in just 64 seconds last night at the Honda Center in Anaheim, California, to take the UFC Heavyweight Title and hand Velasquez his first pro loss. It was the network premiere for the sport. The UFC recently signed a seven-year deal with FOX Sports. Dos Santos’ career mixed martial arts record is 14-1-0. His sole loss was to Joaquim Ferreira (a Round 1 submission in 2007). For the UFC, though, Dos Santos is 8-0. Here’s a quick look at those eight wins, and Junior’s road to the championship. The Brazilian striker’s nickname is “Cigano,” which literally means “Gypsy.” How’d he get that nickname? The UFC has officially arrived. That’s not to say the MMA organization hasn’t grown wildly popular over the past decade, but now it has cemented a place on network television for the next seven years. The UFC and FOX Sports have inked a seven-year deal that will televise UFC events on FOX’s main network channel, as well as FX and Fuel TV. See the press conference here. “The deal plans to bring four major events to the main FOX network, as well as 32 live fights and two runs of “The Ultimate Fighter” a year to the FX network. Plans also include to bring pre- and post-fight coverage, as well as other UFC programming, to Fuel TV. One of the biggest changes, however, is to the format of the promotion’s reality show, “The Ultimate Fighter”. For Matt Juul‘s full article on the agreement, click this must-read. Now a lot of fans are in the know on UFC champion history, but now that the UFC is hitting the mainstream airwaves, here’s a primer for the muggles: the current and longest reigning champions from all seven weight divisions. 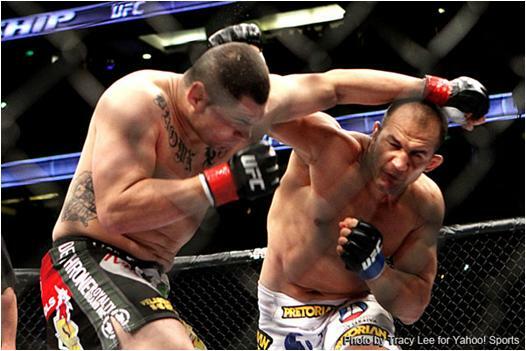 Junior Dos Santos defeated Shane Carwin Saturday at UFC 131 in a three-round unanimous decision: 30-27, 30-27, 30-26. Dos Santos will now look to take on current champ Cain Velasquez. 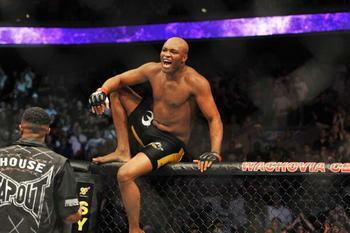 For all the UFC 131 results and recaps, click here. Here’s a list of the greatest heavyweight champions in UFC history, based on length of time as title holder (in days). And when you’re done with that, take a look at the UFC Hall of Fame.